Immediately I am already disappointed with my prospects. Nothing about my living situation says “royal” right now. I am married to Mathilde de Provence, a local noblewoman of no account either to me or to anyone else. The truth is, though I love my natural daughter, she was conceived out of wedlock and I married dear Mathilde, the most boring person under heaven, to preserve the honor of us all. Some years later, I am less than thrilled with my decision. Meet my oh so lovely wife. Naturally, we are childless, as God does not smile on a loveless union, but I will be patient and tend my garden in the meantime. Getting an annulment is just too much work, anyway. In the first months of 1067, Genoa and Pisa start squabbling over rights and goods. I think it high time to remind the bishop of Nice that his de jure liege dwells not on the shore of the Ligurian Sea. 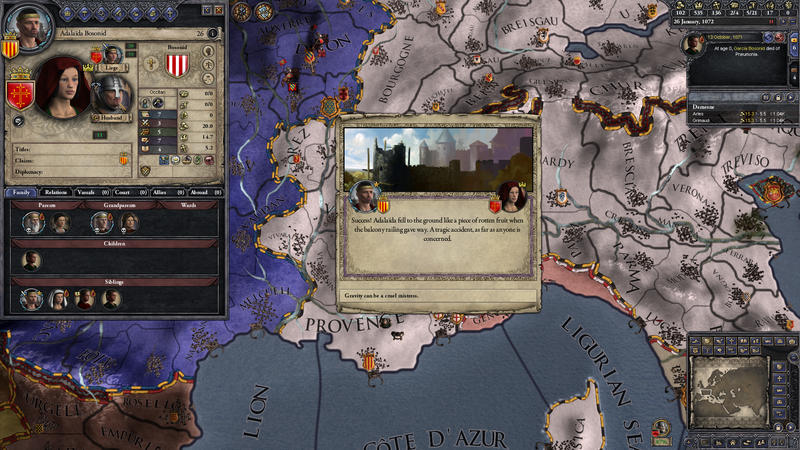 In preparation, I dump my useless cousin, who had begun arguing that swords were the only siege engines we needed, and replace him with my mother’s new husband, a scion of the house of d’Este in Lombardy. He, at least, does not talk so much, and thereby we get results. The bishop bends knee, although the local mayor and baron do not do the same until Duchess Matilda of Toscana annexes Genoa in a brief and bloody war a decade later. 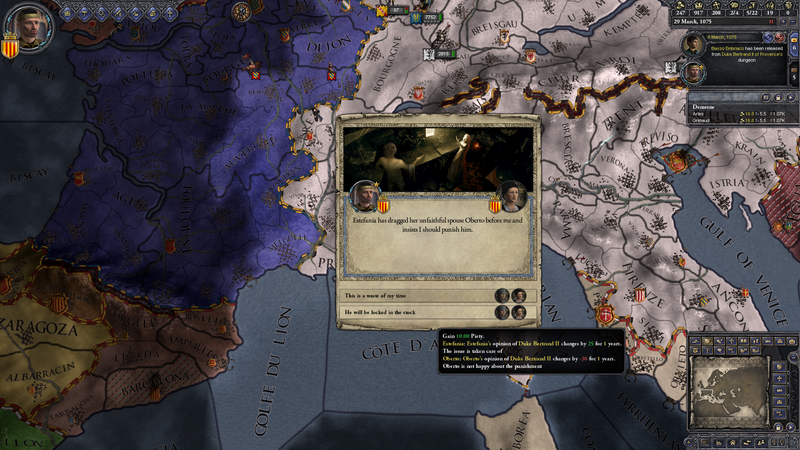 Unfortunately, mother is not nearly as happy with Uncle Oberto d’Este as I am, so I have him beaten and locked up for a bit after he strays from her. Everyone wins! How dare he treat my mother like that! Actually, I’m having problems with every part of my family. 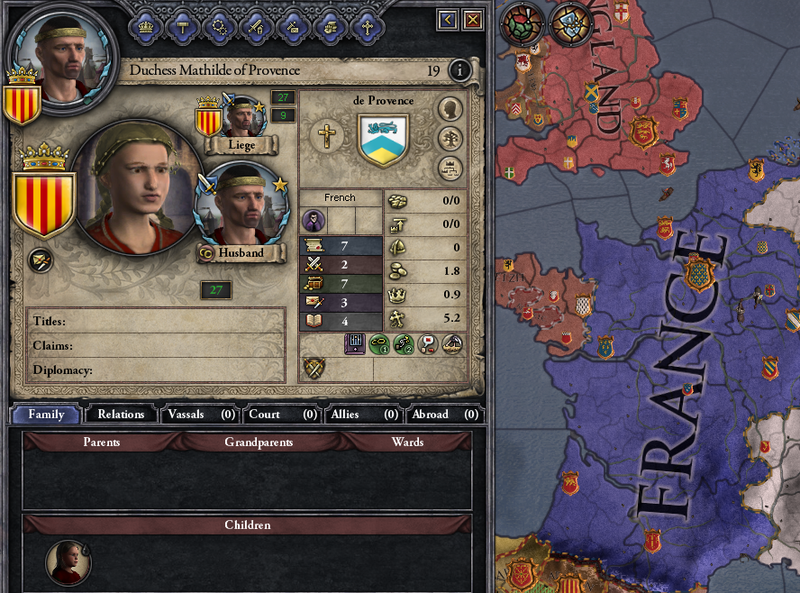 My once-beloved sister, married to the dukes of Toulouse, conspires with them for my throne. I heard, from a little bird, that she meant to make me fly from the parapet. Adalaïda, you are dead to me. I spend almost a year praying for the proper action, but receive no action, and therefore decide to repay like with like. I send several envoys west, carrying money I have earned from the two bishops now loyal to me, to make sure it is Adalaïda who takes the fall, literally! The act aggrieves me, not just because killing is a sin even if you do not draw the blade yourself, but also because I still have no heir from the womb of my boring disappointment of a wife. Adalaïda may have been filled with Toulousain poison, but she was blood of my blood and well fit to sit on my throne. With her regrettably dead, I have one less pillar to lean on. 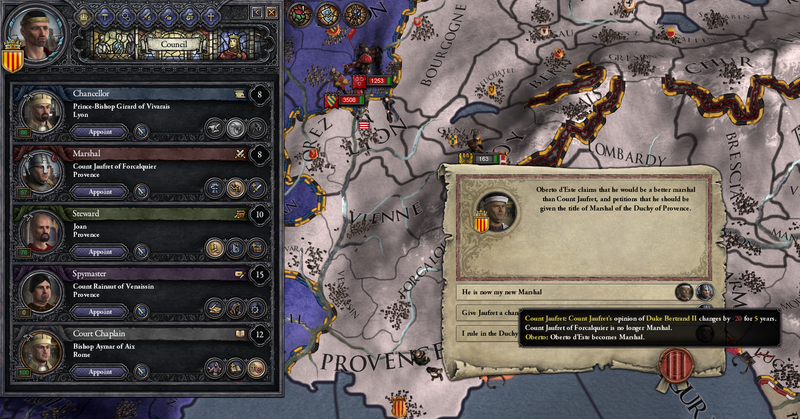 And then, in late 1069, my wife becomes pregnant and soon bears me a son! Mirabile dictu, a son for me! His name is Garcia, after a great hero of the Spaniards, and though he is a bit small and quiet insofar as I have come to expect infants to be, he is beloved to me and my line. Did I mention that Mathilde died in childbirth? Yeah… It is a tragedy, for sure, but no doubt she sits in heaven right now, at the right hand of the son, smiling at me and my boy. I will raise him well and make our ancestors proud. The Bosonids are on the up and up! 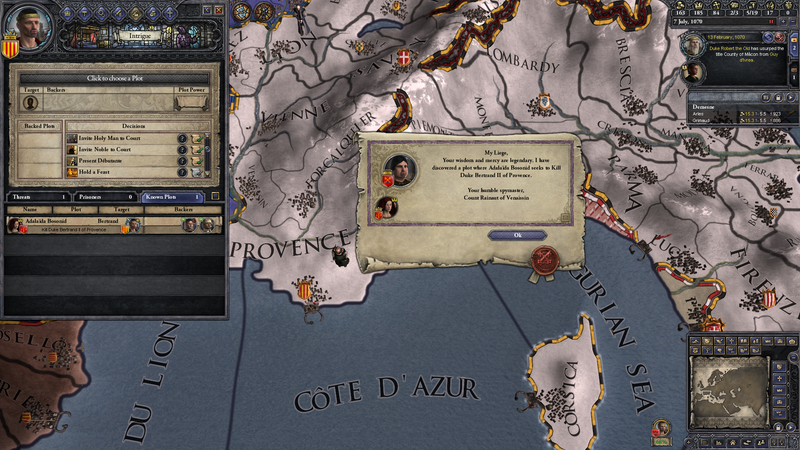 This entry was posted in 3MA/Idle Thumbs Forum: Crusader Kings II Succession Game and tagged Ck2.